There's money in just about anything of a sporting nature it seems. 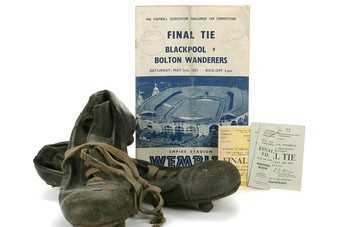 Only this week, boots worn by Sir Stanley Mathews in the 1953 FA Cup Final have been sold at auctioneers Bonhams in the UK for GBP38,400 (US$58,700). Mathews - arguably Blackpool and England's greatest ever player - enjoyed a career spanning nearly 33 years and reached the ripe old age of 50 before hanging up his boots. Mathews' boots - a far cry from the metatarsal-inducing flimsy footwear worn by today's pampered stars - initially had an estimated price of GBP6,000-GBP8,000 - and were used by the winger in the 1953 FA Cup blue riband climax where his performance was viewed as so outstanding the game became know as the Mathews Final. "There was such interest before the sale," a Bonhams spokesman told just-style. "We were surprised by the sale of what it went for." Mathews also enjoyed a prolific career with North West England club Blackpool winning the first ever Footballer of the Year trophy. "The price far exceeded our expectations and the buyer fully deserved the round of applause when the hammer fell on these very special mementos of a very special player," said Bonhams football spokesman Dan Davies. And just to prove the public's appetite for sporting trivia is never sated, the same auction saw a Premier League-winning medal thrown into the crowd by José Mourinho following Chelsea's 3-0 win against Manchester United, fetch GBP16,800. Mourinho is widely rumoured to be planning a return to the top flight of English football. Whatever the man wears - coats, shoes or medals is pure box office - Bonhams must be licking their lips in anticipation.